Curiosity, drive, and a passion for dairy—this BYU alum has all the ingredients of one of the country’s top ice-cream experts. 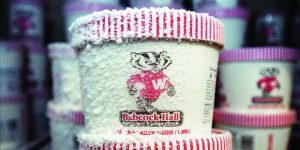 Rankin teaches special workshops, among other courses, where budding ice-cream entrepreneurs can learn the chemistry of creating quality ice cream and get hands-on experience in the university’s processing plant. Most of the ice cream his students produce is donated to local fire departments. Workshop participants make their own flavors, and they can get pretty creative. Wasabi, goat cheese, curry, and “Sunday-morning breakfast”—pancakes with maple syrup and bacon—are among the most unique flavors dreamed up by Rankin’s students. If Rankin were to create his own flavor, he’d combine Madagascar vanilla and honey and call it “Bee Curious”—a name he hopes would serve as a reminder that there is a lot to learn about ice cream and dairy. These students made BYU’s first student film for class credit. Test your BYU Creamery knowledge here.